Sushi in Prague is too expensive. Cheap sushi is hard to find. ThaiOishi, which I wrote up recently, was one of the few relatively inexpensive places I’ve found. I’ve heard some speculate, “Well, Prague is far from the sea. That’s why it’s expensive.” Which is nonsense. Paris is far from large bodies of water, and I’ve found plenty of Asian shops there with nigiri for 1 euro each. So when I find another cheap sushi place just a 10 minute walk from my flat, I have to stand and applaud. Or sit and write. I thank “Crispy” again for tipping me off. 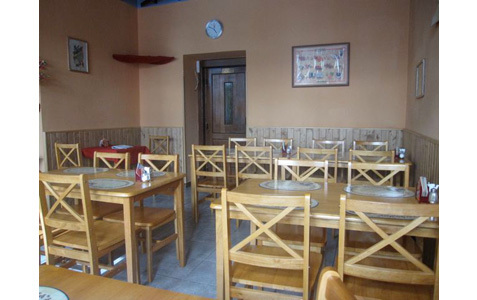 I’m talking about Sushi Tam Da on Perunova, not far from Vinohradska. The non-descript exterior is matched by the non-descript interior. There’s just one room, and it ain’t too pretty. But I’m less picky about where I eat than what I eat. My favorite sushi is unagi, or freshwater eel. 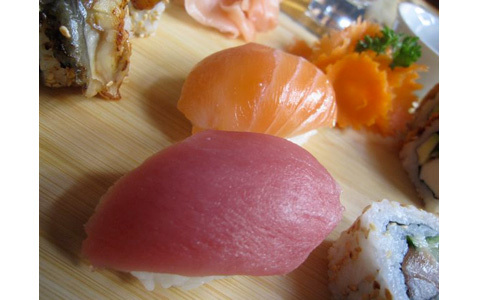 In Prague, it is usually one of the most expensive things on a sushi menu. So when I saw Tam Da’s sushi menu, I couldn’t believe my eyes. 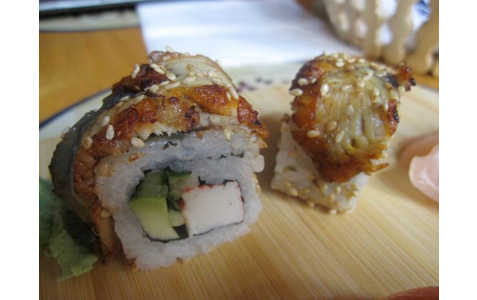 It offered four California rolls (surimi, avocado, cucumber) with each roll topped with unagi. And it was only 88 CZK. For some perspective, at Miyabi, just one piece of nigiri with this fine flesh will set you back 100 CZK. One unagi nigiri at Samurai costs 140 CZK. At Sushi Bar the same order is an astonishing 249 CZK. Tam Da gives you four pieces of unagi with a roll underneath for a fraction of that. It’s certainly better than the cold, rubbery unagi I had recently at Hanil. Maybe the eel is better at the other places I mentioned. I wouldn’t know. Except for my Hanil experience, I’ve always considered unagi too expensive to order and enjoy in this country. Tam Da’s were tender, tasty, and served cool. The roll underneath was less successful — the surimi didn’t have good texture and the avocado was not ripe. But all I cared about was the eel — the rest was just an inoffensive platform for it. 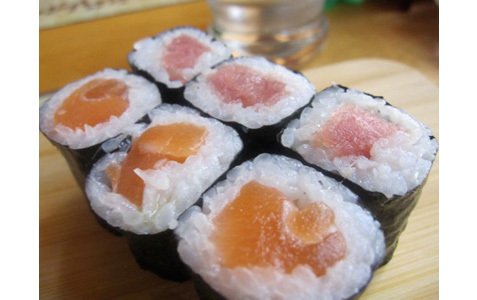 I always order tuna nigiri (38 CZK) and salmon nigiri (34 CZK). The pieces may be slightly smaller than average, but the prices were at least half of what you’d pay elsewhere. Tuna nigiri at Sushi Bar is 149 CZK and their salmon is 99 CZK. 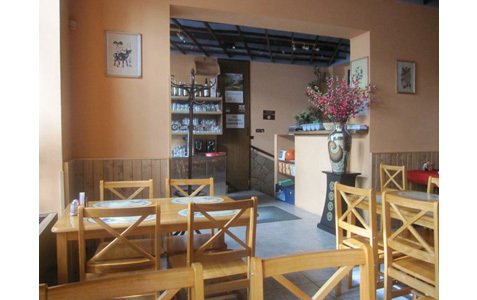 At Samurai, the prices are 90 CZK and 80 CZK, respectively. I was happily surprised the Tam Da’s tuna tasted so fresh, with no fishiness. The buttery salmon glistened. The rice was also not too cold, and had a sweet tang to it. 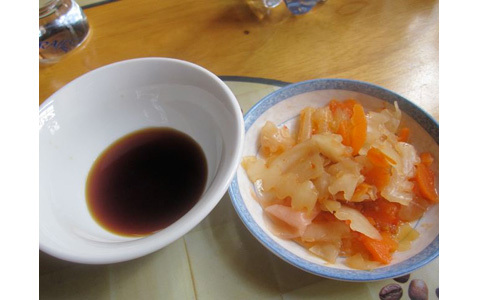 Perhaps there was too much rice vinegar in there for some, but I liked it. I also tried their tuna maki (64 CZK) and salmon maki (58 CZK). It was just fine, with the same good fish. 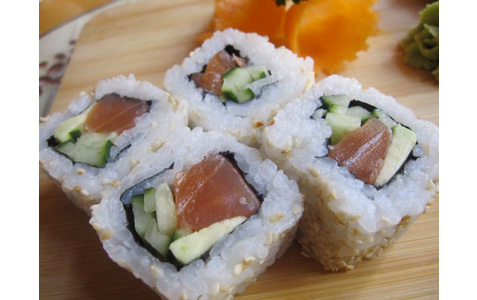 The menu has a bad habit of calling many different kinds of maki “California rolls.” I tried the one with salmon, avocado, and cucumber (68 CZK). The salmon was good, but again, the avocado wasn’t ripe. Still, it was a filling portion for a fair price. The sushi was served with a very sweet and spicy kim chi, along with Kikoman soy sauce. 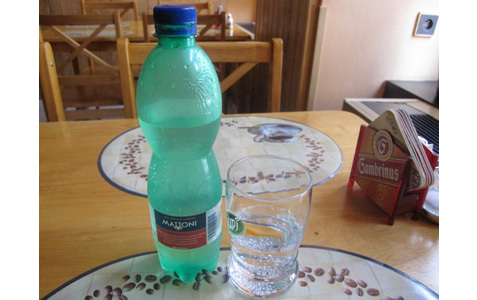 I was drinking Mattoni with my meals. 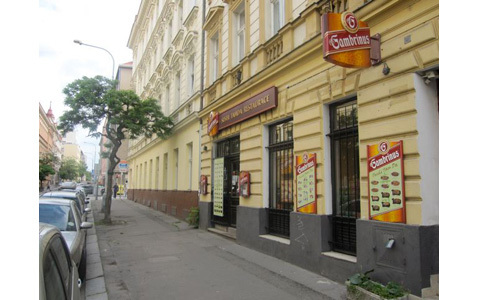 The beers available are Kozel, Gambrinus, and Pilsner Urquell. What about the non-sushi offerings? Tam Da does have a larger menu that covers those familiar Czech-Vietnamese interpretations of Chinese, Thai and other Asian cuisines. 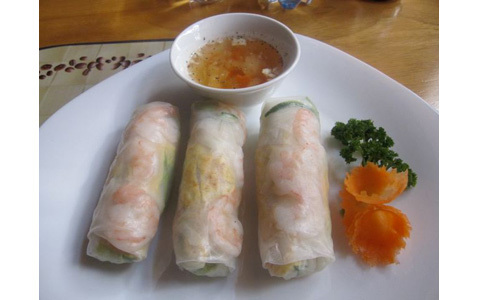 On one visit, I went for the cold spring rolls. 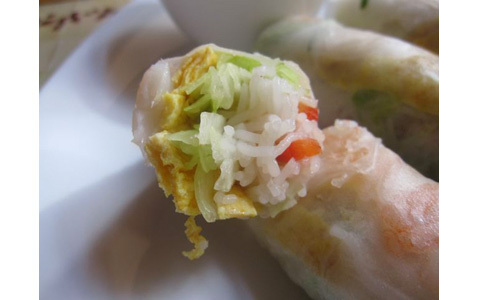 They were filled with omelet, lettuce, red pepper, cucumber, shrimp, and unflavored noodles. They were very bland, and would have much benefited from the insertion of mint or basil. There was a sweet dipping sauce on the side. I tried Tam Da’s version of Tom Ka Gai soup (34 CZK). 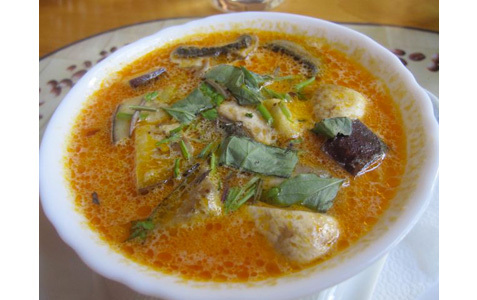 The spicy, sweet coconut broth had some of the usual ingredients like cilantro and lemon grass. Despite the sweetness, it was bland and needed some balance. I asked for fish sauce in Czech and English, but the owner didn’t understand. So I said “Nam Pla” the Thai word for it, and he got it. There were also less usual ingredients like eggplant, basil, tofu, and sliced banana. Banana? That’s right banana. Finally, I went for the “Thai-style rice noodles,” which I assumed would be their version of the classic dish, Pad Thai (74 CZK). 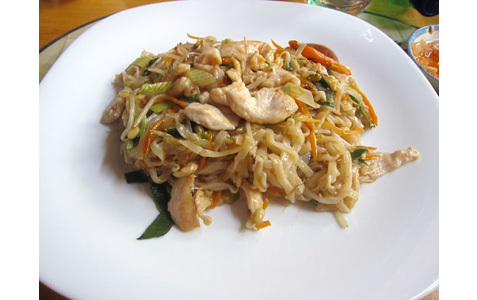 It looked like Pad Thai. It has many of the expected ingredients. It just didn’t taste much like anything close to an authentic version. The first thing I noticed was the dominating, disconcerting flavor of Czech soy sauce. The noodles were overcooked and gloppy. It was quite salty. I didn’t like it. But I asked for some lemon, and then poured the rest of my sweet kim chi into it. After that, it was much better. The bright spot with this dish was the chicken. Unlike many other restaurants which cook the Phad Thai meat into dry, leathery chunks, this one had buttery, tender, and savory chicken pieces. It’s another cheap meal, but just be prepared to season it yourself. I spoke to the owner and he said business was best at dinner. But he said they are doing a lot of take-away business throughout the day. He said the location is not great for foot traffic, but things are slowly building with word of mouth. And the words from my mouth are these: Forget about the rest of the menu, but go for the sushi. It is not world class and not even top Prague class, but it is better than you’d expect, considering it is perhaps the cheapest sushi place in the city. Too often in Prague, eating sushi in Prague can be disappointing in terms of quality. And you walk out feeling financially filleted. But Sushi Tam Da can be a nice, cheap pleasure.